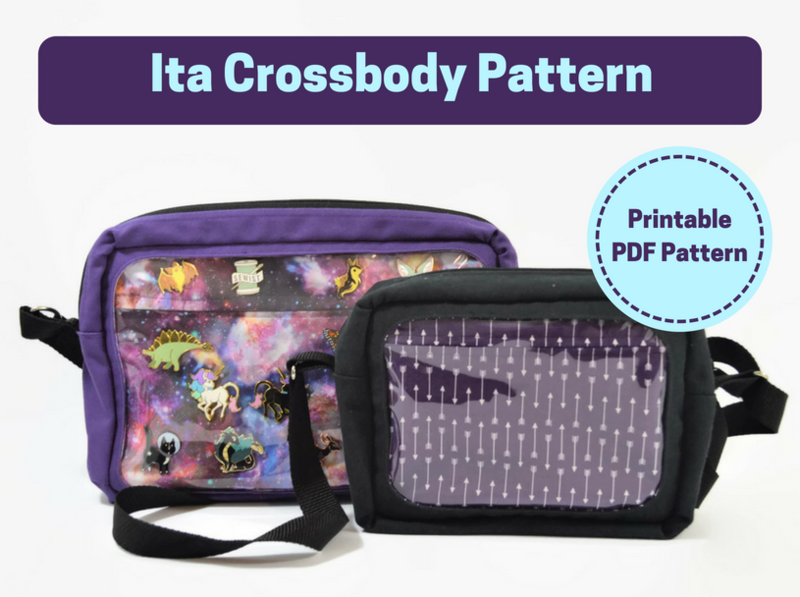 I’ve just launched my latest ita bag pattern: The Ita Crossbody Bag! It’s a simple, rounded-rectangle crossbody with an adjustable strap and rounded top zipper. It has a divided slip pocket on the inside, opposite the pin pocket access panel. The zipper for the pin pocket is mostly-invisible; I designed it this way to balance the difficulty of making the bag with functionality and looks. This pattern also comes in two sizes, which is a first for me! The normal size is about 12″ wide, and the mini version is about 9″ wide. The larger one is great for carrying larger things like books and displaying as many pins as possible; the mini is great for everyday use while showing off your very favorite pins. The pattern can be purchased at my Shopify or Etsy store. Thank you for reading and I hope you like it!